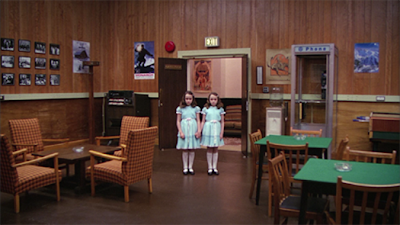 Kubrick's 'The Shining' always seemed to be the black sheep of the family. It seemed to get mixed reviews on its release in 1980 and is often regarded as the poor relative to his other films. Personally, it's one of my favourites. It features two powerhouse performances - Jack Nicholson and Shelley Duvall playing Jack and Wendy Torrance - and some breathtaking Steadicam photography. Again, it's a supreme example of Kubrick's pure cinema - he tells a great deal of the story in visual terms and uses very little dialogue to explain what exactly happens at the Overlook Hotel. The soundtrack is equally intriguing. From the Wendy Carlos synthesiser sweep over the helicopter shots in the opening to the abundant use of Bartok's Music for Strings, Percussion and Celesta for the creepier moments such as Danny's fear of room 237. The film is here presented in its longer form - including additional scenes not in the European cut - and, at last, in an anamorphic 1.78 ratio. Quite simply, the 1080p image here is pretty stunning, extremely well detailed especially in close ups of faces and clothing. It also shows off the production design to its best and the interiors of the Overlook, a staggeringly lovely set, looks beautiful with superb colour, contrast and definition. Coupled with the heavy use of Steadicam the image has a superb depth that HD clearly exploits here. I was also impressed with the sound too and the placing of stereo elements, the use of the Bartok, Penderecki and Lygeti music cues and dialogue is sensitively done whilst impressively cranking up the atmosphere. With these new Blu-ray releases of the Kubrick catalogue we're also being spoiled with a collection of extra features too. There's a fascinating commentary with Steadicam inventor/operator Garrett Brown and Kubrick biographer John Baxter. “View from the Overlook: Crafting The Shining” is a half hour “making of” featurette featuring interviews from the crew, writer, designers and Nicholson. “The Visions of Stanley Kubrick” is a short introduction to Kubrick’s early career as a still photographer. “Wendy Carlos, Composer” is a short interview with the film's composer which also delves into some of the cues for A Clockwork Orange, some of which didn‘t make it to the final films. The BBC documentary 'The Making Of The Shining', directed by Kubrick's daughter, Vivian, also makes it onto the disc and with a commentary from her to accompany it. This is probably the best this film has ever looked and despite its age it looks remarkable in HD and demonstrates that back catalogue material can hold its own with newer releases. Definitely worth the upgrade.